I woke up early on my second day in East Timor and said goodbye to Stefanie as I planned to catch the bus to Baucau, the country’s second largest town. Some people had warned me against taking their public transportation, suggesting that it was extremely uncomfortable. But as I was traveling alone, I had no other choice if I wanted to go outside of Dili. I had the taxi driver drop me off at Becora, where buses to Baucau departed from. It was a dusty station located in a ramshackled part of town (I later came to realize that many of the city’s roads away from the center are nothing more than dirt tracks). I got there just in time as the bus, already filled up, was just about to depart. All the warnings about East Timor’s buses turned out to be true as passengers were stuffed like sardines inside the vehicle. I was seated in between a nun and a farmer, and could barely move. The rickety bus had no aircon and no other amenities aside from the speakers that blared loud, reggae-type Timorese music. Some passengers opted to stand the whole journey (3.5 hours) to pay half-fare while others stood by the (open) door, their hands clenched to the outside handles in the same way they do it with jeepneys in Manila. It was pretty remarkable they could handle it for three straight hours without ultimately falling into the roadside. The bus had obviously seen better days, and it must have broken down ten times during our journey. For all its shortcomings, the ride included a lot of scenic views of jagged hills falling into the blue sea, rice fields and pastel-colored churches. We passed by several beaches that were more impressive than the ones in Dili, and it’s a shame I didn’t get the chance to stop by. One of the few passengers who could speak English chatted me up. A native of Mt. Matebian (East Timor’s 2nd highest peak), Atheno was taking a few courses in Dili. He also told me about his student days in Yogyakarta, Indonesia where he previously received a scholarship. He was a nice fellow, and offered to show me around Baucau when we landed. The bus dropped us off at Baucau’s new town, which is a drab area with no points of interest. We had to take a mikrolet (small bus) to the old town, where many interesting sights were located. I made sure to stop by the Mercado Municipal ruins – a fine example of colonial Portuguese architecture, Pousada de Baucau – said to be the most charming place to stay in East Timor as well as the natural spring located near the town center. I had lunch at Restaurante Amalia, probably the only place resembling an eatery in Baucau. After the meal, I parted ways with Atheno- he was going off to Matebian – and I was left alone in that strange town. I had planned to go to Osolata, a fine white sand beach 6km north of the town, but mikrolets were no longer running by that time in the afternoon so I just wandered a bit around Baucau. I had no idea where I was going to stay for the night. For $60, I found the Pousada to be above my budget. I managed to find a place to stay for $30 – still above my budget but it was the cheapest place I could find. The Albegaria Planalto was a simple 8-room hotel at the edge of a plateau and owned by a bishop. When I “checked-in,” I found out there only 2 other guests (both UN workers). I was the only tourist. The manager, Albert, was an amiable fellow. I rode his motorcycle that evening when I went back to Amalia in old town for dinner. It was a wonderful experience traversing Baucau’s zigzagged roads with the cool sea breeze. The next morning I took off for Dili, onboard the dreaded bus again. This time it was worse. People freely smoked inside the vehicles and it was suffocating. The bus was once again packed like sardines, and to top it all off, a live pig was tied to the roof, squealing and shaking the whole time. 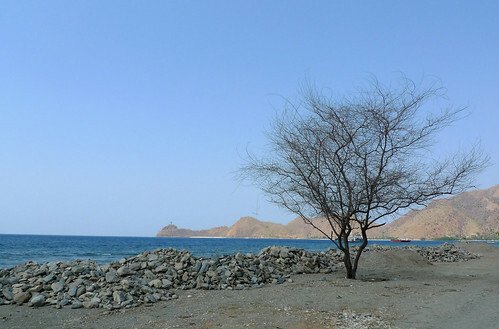 I was so relieved when we reached Dili and I asked the driver to drop me off at Caicoli, near the city center. This time, I decided to stay somewhere better and checked in at Hotel Oriental. For $40 a night, I got an airconditioned room with TV but it was still way behind western standards as it did not even come with a toilet and the room only looked half-cleaned. I stopped at a nearby warung (Indonesian cafeteria) for a filling Padang-style lunch for only $2 and ventured to see the other parts of Dili after that. I visited the tais market, where they had local souveniers for sale. I also walked all the way to Lecidere, where the Xanana Gusmao Reading Room as well as Nobel Prize winner Bishop Belo’s residence are located. From there, I grabbed a cab to Areia Branca beach, about 8 minutes drive. Despite its proximity to the city center, the area was still relatively underdeveloped. A few beachside bars and huts were available and I was so relieved to see that it wasn’t over commercialized. It was there that I chanced upon this nice Filipino family who were swimming by the beach. I knew because I heard them talking in Tagalog. We exchanged hellos and before I knew it, I was asked to join them. They were from Couples from Christ and they clued me in on the local situation. It surprised me to learn that there was a large Filipino community in East Timor. I was told that Dili had several Filipino restaurants (even beating Singapore). Since I was leaving the next day, they even gave me an impromptu despedida (farewell party) right by the beach. I couldn’t have felt more at home. I didn’t do much the next day as I was flying back to Bali that afternoon. 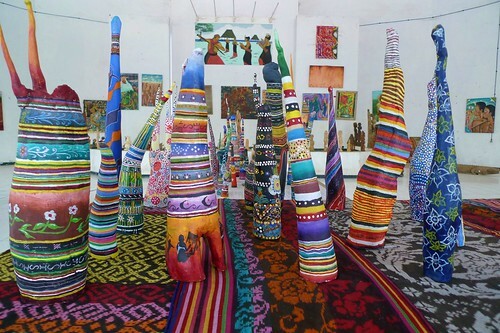 Before leaving for the airport, I dropped by Arte Moris – an art gallery featuring works by local Timorese artists. 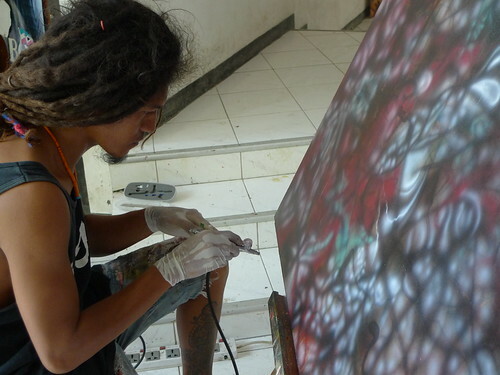 The art mostly revolved around similar themes – agriculture, rural life and crocodiles (highly respected in Timorese culture). Arte Moris also doubles as a residence for these talented group of people, and one of them showed me around their studios within the many buildings inside. After this, I was off to the airport once again for my flight out of the country, leaving the dusty streets of Dili for now. All in all, I could say it was a unique trip. I wasn’t so much enamored by any scenery or historic building as I was with the warm people of East Timor. I believe the country is greatly misunderstood and deserves a visit by travelers doing the Southeast Asian trail. Although it does not offer luxury or comfort, it presents something different – and that is the discovery of a proud culture untainted by kitsch or mass tourism. More than a week ago, I took a spur of the moment trip to East Timor. This 10-year old country is probably the least known in Southeast Asia, and everyone – from the manager of the hostel during my transit in Bali to other travelers I met in Indonesia who didn’t even know there was such a country – couldn’t help but wonder why I wanted to go there. East Timor has never been in my priority list of destinations, and until a few months ago, I didn’t even think I would go there. Last July, I hatched up a personal goal to visit each of the 11 countries in Southeast Asia and it was for this strange, if not childish reason that I went. Although I am not particularly proud of the reason why I went or the timing in which I made my journey, I am glad that I did visit this relatively isolated, often misconstrued country that only gets 19,000 tourists per year. East Timor may be extremely impoverished, war torn and lacking in tourist infrastructure, but I can say that those who visit are ultimately rewarded with the nation’s natural and relatively unspoiled beauty, warm and friendly people as well as cultural variety. I booked my ticket to Dili, East Timor’s capital upon landing in Bali Airport. East Timor has air links with just 3 destinations (the others are Singapore and Darwin) and flying through Bali is the cheapest option. I found that it is usually okay to buy tickets on short notice except for weekends when NGO workers in East Timor may decide to fly to Bali for leisure trips. Before boarding, I met this Filipino guy who was flying to do some rural development consulting in East Timor. He gave me his contact details and asked for mine just in case I got affected by possible instability – but he was quick to add that East Timor was generally safe despite its bad reputation. The flight to Dili from Bali took about 1.5 hours and was largely uneventful except for some nice views of Indonesia’s volcanic islands along the way. As the plane was making its descent, the brown rolling hills of East Timor’s northern coast came into view. Before I knew it, the plane landed at Dili’s Nicolau Lobato Airport. The airport looked very similar to other airports except that the security presence was very much evident. Helicopters and other small planes carrying the UN logo were parked aplenty at the runway, and policemen from all over the world (Philippines included) scrutinized us as we made our way to the arrival hall. I took a taxi upon exiting the airport and went straight to East Timor Backpackers Guesthouse, reputed to be the only backpacker accommodation in the country. The taxi ride on the way was a testament to the laidback and carefree culture of the country, as the taxi driver stopped midway to pick up his friends who were traversing in the same direction. I thought at first that I was getting mugged right then and there in my first taxi ride in Dili but I later realized that it was just a normal part of day-t0-day life in Timor. The rooms and bathrooms at the backpackers place were on a sharing basis – all I got was a bed. At US$12, I thought it was pricey but then most things in East Timor are expensive anyway. 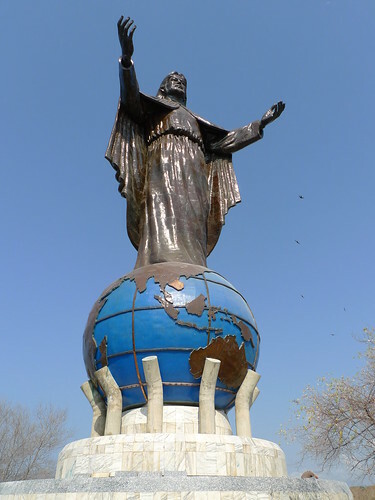 I literally just dropped my bags and went straight to Cristo Rei, said to be the second largest Jesus statue in the world after Rio’s and probably the most recognizable landmark in East Timor. The statue was perched high on a hill, but the climb was not so bad and I passed several stations of the cross along the way. Just before making my last climb, one of the construction workers in the site called me and indicated that he was going to climb with me. We chatted a bit and I later learned that he was earning $4 a day carrying bricks back and forth to the hill top as they were renovating the site. I reached the summit in no time and found the statue freshly painted. The construction worker revealed that China was shouldering the costs, and there was indeed a Chinese guy surveying the base. The view from the top was magnificent – I could see a beach with clear blue waters to the east and west, as well as towering mountains in the center. Going down from Cristo Rei, I went to Dili’s downtown. For all the city’s shortcomings, it does have a charming waterfront. The water was clear and there was a beach just a few minutes away from the main square. 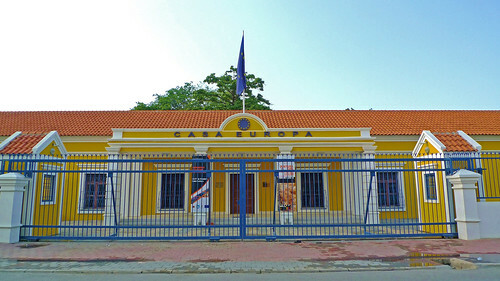 Dili has several notable buildings with obvious Portuguese influences such as the Palacio do Governo (Government House) and Casa Europa. A lot of foreigners, mostly aid workers from the UN and other NGO’s, prowl the streets of Dili. That may be true but the locals couldn’t help but stare at me, with a camera-strapped-around-my-neck look that screamed tourist. Despite this, nobody did try to con me or solicit something from me, which is a welcome departure from my experiences in other more touristy countries. In fact, I found the locals to be pretty honest. I unknowingly dropped my camera case once and someone nearby alerted me of the mishap. After making the rounds in Dili’s center, I went to an Indian restaurant beside the guesthouse for dinner. It was already the cheapest place I could find at that time but it still cost me $4.50. After dinner, I called in an early night and went back to the guesthouse. During that night, there were only 2 other guests – a German girl named Stefanie and an Indonesian man. I chatted up quite a bit with the former, whose bed was just beside mine. Apparently, she’s done the whole bit around Nusa Tenggara – starting with Bali, then to Lombok, Flores and West Timor. 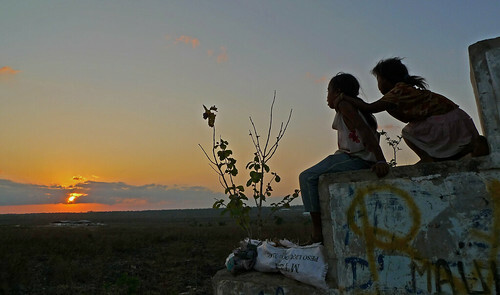 Although she admitted that the other islands may have better scenery, she told me she was staying in East Timor longer. 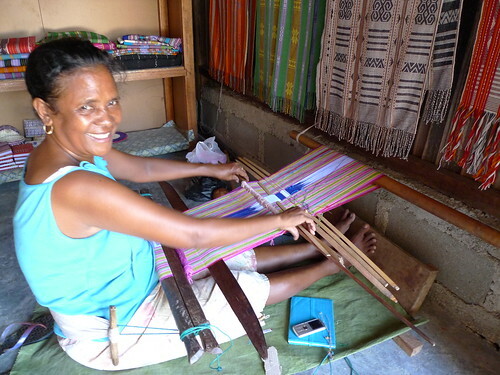 She loved the country so much she even volunteered to do some charity work in Oecussi (enclave of East Timor). We ended up exchanging travel stories the rest of the night, although mine certainly were nowhere as adventurous as hers. 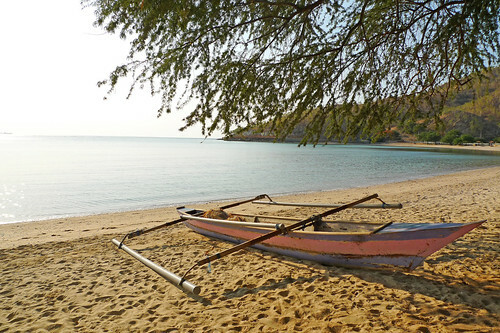 Dili, the capital of East Timor, is not as isolated as one may think. Direct flights are available from Singapore, a major transportation hub, as well as from Bali and Darwin, Australia. I took the flight from Bali which is usually the most economical option by air. 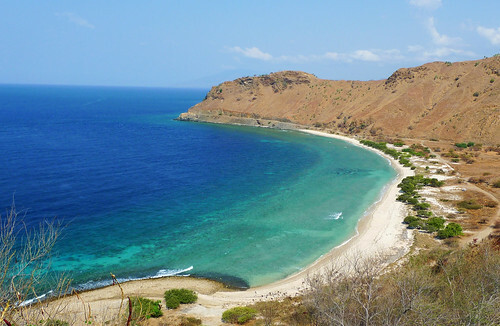 Otherwise, the cheapest option – if you don’t mind traveling for several hours – is to land in Kupang, West Timor, Indonesia and take a long bus ride to Dili.